Validate Products: To validate the product before uploading it to the fruugo.com. It displays the corresponding validation error if any. If there is no error, it confirms that the product is ready to upload. Validate And Upload Products: To validate the product before uploading it on the fruugo.com. It displays the corresponding validation error for all the products if any. If there is no error, then it validates the selected products and then uploads them to the fruugo.com. Update Inventory: Updates the inventory of the product on fruugo.com. This action completes all the job related to the product inventory and also it manages the quantity related issues. Go to the Manage Products page. Select the check boxes associated with the required products. In the Actions list, click the arrow button. Note: If there is an error in validating the product, then it appears on the page and the Invalid button appears under the corresponding Validation column displayed on the Manage Products page. Otherwise, a success message appears. Correct the issues and then again repeat the process of validating and uploading the selected products. Click Validate And Upload Products. Note: If there is an error in uploading the product, then it appears on the page and the Invalid button appears under the corresponding Validation column displayed on the Manage Products page. Otherwise, a success message appears. 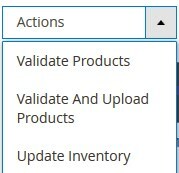 Note: If there is an error in synchronizing the product inventories in bulk, then it appears on the page and the Invalid button appears under the corresponding Validation column displayed on the Manage Products page. Otherwise, a success message appears. Correct the issues and then again repeat the process of synchronizing the product inventories of the selected products.